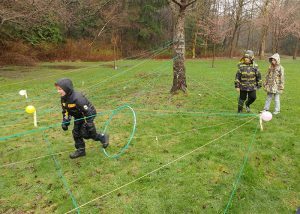 For weeks our school was preparing for the first Outdoor School Event in April. 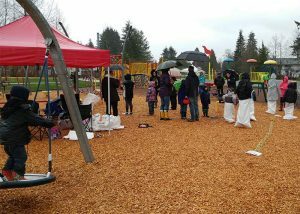 Hawthorne Park in Surrey was chosen as the location which was perfectly located close to school and had all the amenities we needed. Days before we knew the weather would not cooperate and it would rain, so lots of tents were put up. The day started with 90 minutes of Outdoor Classes which the teachers prepared accordingly with lots of German exercises involving speaking, listening and reading. The students were then mixed up and divided into nature groups: Baum(tree), Blume(flower) etc. Wet and happy the students were then called for the Hot Dog Lunch which was prepared by the board members. There were Hot Dogs from the BBQ, German cucumber salad, potato salad, veggie ans fruit platter and hot chocolate. After the lunch the main attraction took place: the Easter Egg Hunt. 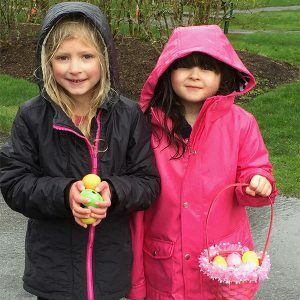 Off they went to fill their little Easter baskets with chocolate eggs. 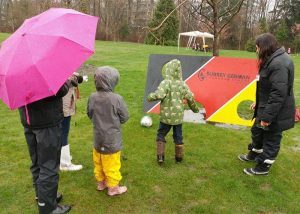 Despite the weather, everyone had a good time and the plans are to make this an annual event.